This post is sad and angry. I don’t mention any names, but some people may read it and identify themselves here. Here’s my request to these people: I hope that this doesn’t hurt you personally. It’s not my intention to hurt anyone personally. All people have to do their jobs; sometimes they are happy about what they do despite some people’s complaints, sometimes they aren’t happy, but do it anyway because they need to pay bills, or because that it’s necessary for some kind of greater good. I totally get it. There’s a certain chance that I’ll meet some of you online or in real life. If this ever happens, I hope you don’t feel embarrassed or intimidated. I’ll be happy to meet you and I promise to be friendly. Thanks for understanding. I used to be a prolific writer on the question and answer website Quora. I was even named a “Top Writer” four times. Sadly, in 2018 this once-fine website ruined itself. The problematic signs were there even earlier, but the true catastrophe began with the “Links” feature. This feature adds links to articles on other websites to the Quora feed. Before this feature’s introduction the feed consisted mostly of questions and answers, as one would expect from, you know, a questions and answers website. There’s no way to select a website to follow and see links from. There is a way to mute websites, but other sites will be shown instead. There’s also no way to remove all the Links from the feed completely. By popular demand from Quora users, a volunteer made a browser extension called “Qure” that does it, but it only works on the web and not on the Quora mobile app. The Link items in the feed look almost exactly like questions, which is severely distracting, and feels out of place. Quora staff people who work on this feature know it—”the links feel out of place” is a direct quote from a staff person. They know that many users dislike them, but they choose to show them anyway. “We’ll show links less to people who don’t like them” is also a direct quote from a staff person. Let this sink in: They know that some people don’t like the links, and they show them to these people anyway. My logic—I won’t even bother calling it “ethics”—tells me that when you know that a person doesn’t like a thing, you don’t show that thing to that person at all unless you have a particularly good reason and you can explain it. Another problematic feature that Quora introduced in 2018 is “Share”. This sounds like a sensible thing to have on any modern website, but on Quora it has a somewhat different meaning. “Sharing” on Quora means putting an item in your followers’ feed with a comment. This is similar to retweeting with a comment on Twitter. It works fairly well on Twitter, but Quora is not Twitter. In Twitter everything is limited to 280 characters—the tweets and the comments on retweets. On Quora answers can and should be longer, but the comments are short, and this feels imbalanced. What’s worse, even though Quora says that the comments on shared items “provide additional insight“, they are actually rather pointless. In fact, many of them are not even really written by people, but filled semi-automatically: “This is interesting“, “This is informative”, “Great summary”, “I recommend reading this“, etc. Those that are actually written by humans are not much better, for example: “H.R. has been a wonderful teacher and excellent writer. Since joining Quora last year I’ve latched on to his brilliance – he’s earned his place firmly”. This says nothing substantial that couldn’t be expressed by simply upvoting the writer’s answer. Both links and answers can be shared. I’ve just explained why sharing answers is pointless. Sharing links is a weird thing: On one hand, seeing a link that was shared by a Quora user makes relatively more sense than seeing a link that was added to the feed by faceless software for some reason I don’t know. In practice, however, it doesn’t make the link any more sensible or useful. Shared links feel totally relevant on Facebook and Twitter, but Quora is neither Facebook nor Twitter. It’s a site for questions and answers, or at least it used to be one. And then there are the items that are questions or answers, but that are shown to me on my feed for mysterious reasons: They are categorized under a topic I don’t follow, they are written by users that I don’t follow, and they weren’t even upvoted or shared by users that I do follow. They are just totally, completely unrelated to me. Occasionally they are labelled as “Topic you might like” or “Author you might like”, but sometimes they don’t even carry this label. I would possibly understand showing this Nonsense to new users: Quora may want to suggest you stuff to follow to get you hooked. But I’ve had the account for seven years, I follow lots of people and topics, I visit the site several times a day, and I know very well what I want. What’s worse, Nonsense items are shown to me while many items written by people I do follow are not. I followed people on Quora because their personality or knowledge genuinely interested me. To me, “Follow” means that I’m interested in seeing stuff written by these people. But Quora decided to disregard my specific request, and to show me Nonsense instead. When you mute a Link item it mutes a particular link source, for example New York Times or Breitbart (yes, both are available), but when you mute one source, other sources are shown instead and there appears to be no end to it. When you see an answer on a topic you don’t follow, you can mute that topic, but this (probably) means that if an answer is written in this topic by a user that you do follow, you won’t see it. This is often not what one wants. For example, “Entertainment” is a topic on which answers are often shown to me, even though I don’t follow it. I don’t want to see this random answers, but if a user I follow posts an answer in a question for which this is one of the topics, I’d be OK with seeing it. When you see an “Author you might like”, and you don’t actually like that author, you can mute them. As above, this is not necessarily what I want: If that author happens to write an answer on a topic I follow, I’ll be OK with seeing it. I just don’t want to see that author’s answers when they are completely unrelated to me, but this is a feature, and there’s no way to get rid of it. When I first saw the Links in February 2018, I was immediately appalled: What is this thing that is neither a question nor an answer?! When I saw that I cannot remove them from my feed, I pretty much immediately decided to stop using the site. It was clear to me that something is badly wrong. Even thought I deleted my Facebook account in 2015, I created a new one some time after the links were introduced, just so that I could join the private Quora Top Writers Feedback group. For several months I tried talking to the Quora staff people in that group and understand: Why do the links even exist? Why are they so random and useless? Why are pointless items shown to me? I got almost zero substantial replies. I intentionally came back to sincerely using Quora, thinking that the algorithms will learn my behavior, and show me more relevant links, or no links at all. This didn’t work, of course, and Quora became even worse when the awful Share and Nonsense features were added, so in June 2018 I stopped posting there almost completely. After some more time, the Facebook group’s moderator didn’t like my questions about these unfortunate features, and removed me from the group, too. The explanation was that they were repetitive, which is understandable; what is less understandable is that instead of removing me from the group they could try answering the questions. They didn’t. They did suggest sending my complaints to a particular email address for Top Writers. I did it, and I received no reply. So that’s it, I guess. A legitimate question arises: Could I use Quora without the feed? Not really, because the best thing about Quora was that before the disastrous 2018 changes it showed me answers that interest me and questions that need answers on topics about which I know something. Without this, the site is not that useful. It moved to being oriented much more towards readers who are prone to click on clickbait and to writers who are local Quora “stars”. I don’t belong to either group. I have a bit of a price to pay for publishing this blog post. I probably won’t be a top writer again (this came with pretty nice swag). I might be banned; not that it matters, because I plan to deactivate the account anyway. I may run into Quora staff people at professional conferences, and things may get awkward (see the top of this answer—I do hope to meet you, and I hope that it won’t get too awkward). But at the same time… it’s not actually a big deal. Even though before 2018 Quora was a really nice place to ask my questions and to answer questions for which people need an answer, it is nowhere near being a truly essential site like Wikipedia. Stopping to read and write there every day allowed me to focus better on family and work, and also to revive some old neglected projects, such as translating Wikipedia articles or proofreading Gesenius’ Hebrew Grammar at Wikisource. All that said, yeah, I’d probably be happy to come back. The web does need a good question and answer site, with relevant topics, with pleasant design, and with good moderation. Quora used to be such a site. It is no longer such a site, with or without me. It can easily go back to being one. However, this will only happen when it becomes possible to remove Links, Shared items, and Nonsense from the feed. Some people enjoy random weird algorithmically-selected stuff, and some people don’t. I hate the Links, and the Nonsense items, and a lot of other users hate them, but some people are fine with them. And that’s OK. That’s what preferences are for. A couple of years ago when Facebook was still using me, a person whose opinion I respect very much wrote words of praise to a certain musician I didn’t know as a Facebook status. The description made me think that I may like the music, but I didn’t have time to check it back then, so I made a browser bookmark to remind myself to do it. Today I finally did it… and found out that it’s just a pop singer of the kind that doesn’t interest me very much. At least now I have one bookmark less, which is a good thing. I still respect that person very much. I used Facebook quite a lot. I posted lots of things, I got to know a lot of people, I learned about things that I wouldn’t learn anywhere else, I shared experiences. But the feeling that I am the product and Facebook is the user got stronger and stronger as time passed. It happens with many other companies and products, but with Facebook it’s especially strong. In February 2015 I stopped posting, sharing and liking, and I deleted Facebook apps from all my other devices. I continued occasionally reading and exchanging private messages in a private browser window. Then I noticed that a few times things were shared in my name, and people liked them and commented on them. I am sure that I didn’t share them, and I am also quite sure that it wasn’t a virus (are there viruses that do such things on GNU/Linux?). Also, a few people told me that they received messages from me, and I’m sure that I didn’t send them; It’s possible that they saw something else under my name and thought that it’s a message even though it was something else, but in any case, nobody is supposed to think such a thing. That’s not how people are supposed to interact. I am not a bug, not an A/B test, not a robot, not an integer in a database. I am Amir Aharoni and from today Facebook doesn’t use me. There are other and better ways to communicate with people. Stop saying that “everybody is on Facebook”. I am not. I don’t feel exceptionally proud or special. I am not the only one who does this; a few of my friends did the same and didn’t write any blog posts or make any fuss about it. You should delete your Facebook account, too. My name is written Amir Elisha Aharoni in English. In Hebrew it’s אמיר אלישע אהרוני, in Russian it’s Амир Элиша Аарони, in Hindi it’s अमीर एलिशा अहरोनि. It could be written in hundreds of other languages in many different ways. More importantly, if I fill a form in Hebrew, I should write my name in Hebrew and not in English or in any other language. Based on this simple notion, I wrote a post a year ago in support of localizing people’s names. I basically suggested, that it should be possible to have a person’s name written in more than one language in social networks, “from” and “to” fields in email, and in any other relevant place. Facebook allows doing this, but in a very rudimentary way; for example, the number of possible languages is very limited. Today I am participating in the Open Source Language Summit in the Red Hat offices in Pune. Here we have, among many other talented an interesting people, two developers from the Mifos project, which creates Free software for microfinance. 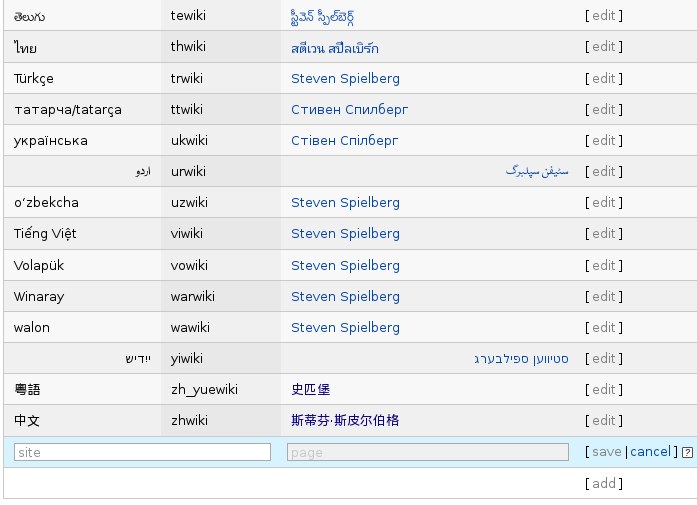 Mifos is being translated in translatewiki.net, a software translation site of which I am one of the developers. Nayan Ambali, one of the Mifos developers, told me that they actually plan to implement a name localization feature in their software. This is not related to software localization, where a pre-defined set of strings is translated. 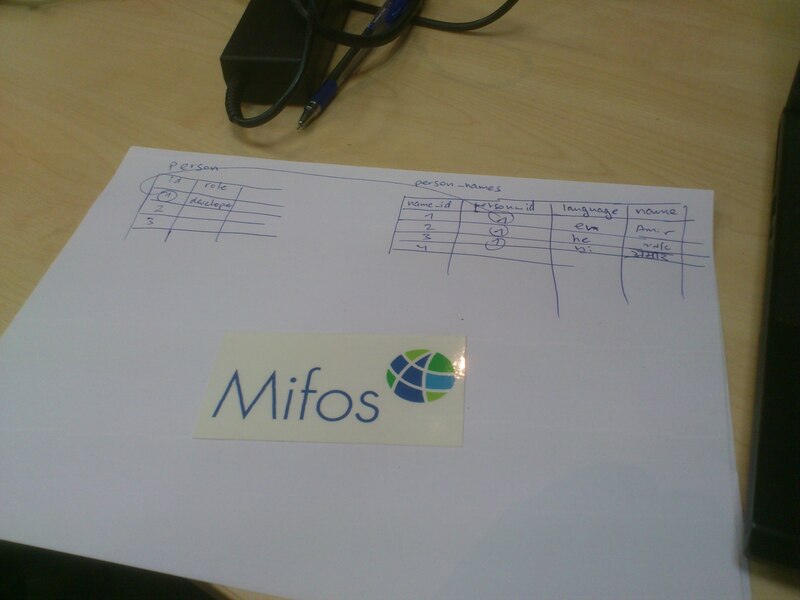 It is something to be translated by the users of Mifos itself. The particular reason why Mifos needs such a feature comes from its nature as microfinance software: financial documents must be filled in the language of each country for legal purposes. Therefore, a Mifos user in the Indian state of Karnataka may need to have her name written in the software in English, Hindi, and Kannada – different languages, which are needed in different documents. Such a feature is quite simple to implement. In the backend this means that the name must be stored in a separate table that will hold names in different languages; see the sketch I made with Nayan above. On the frontend it will need a widget for adding names in different languages, similar to the one that Wikidata has; see the screenshot below. Of course, there’s also the famous problem of falsehoods that programmers believe about names, but this would be a good first step that can provide a good example to other programs. I often help my friends and family members open email accounts. Sometimes they are starting to use the Internet and sometimes they move from old email services (Yahoo, Walla!, ISP) to something modern (like it or not, Gmail). At some point they have to fill their name, which will appear in the “from” field. And then I have to suggest them to write it in Latin characters, even though most of them speak languages that aren’t written in Latin characters – mostly Hebrew and Russian. Chances are that some day they will send an email to somebody who cannot read Russian or Hebrew, and Latin is relatively better known. Only relatively, though. It may seem obvious to you that everybody knows the Latin script, but in fact, a lot of people are not comfortable with it at all. There are also other complications: lossy and inconsistent transliteration rules (is Amir אמיר or עמיר? ), potential right-to-left rendering problems, and more. And of course, all people are happy to see their name in their language. And people are also happy to see their friends’ names in their own language and not in a foreign or a neutral language. I have, for example, a lot of friends in India. Most of them write their names in English, but some write it in Marathi or in Malayalam. It’s certainly good for them, but in practice it’s much harder for me to find them this way, so English would be better – but Hebrew or Russian would be better yet. Finally, there are a lot of people in the world who have more than one linguistic background. Mine are Russian, Hebrew and English, and I am really not such a special case. There are many millions of immigrants who have mixed backgrounds: Punjabi-Hindi-Urdu-English, Kurdish-Turkish-German, Kazakh-Russian-Norwegian, and others, and others and others. From each of these backgrounds they have friends, co-workers and family members, with whom they would love to communicate in the respective language. In each of these backgrounds they have friends who would want to find them using the name under which they know them there and using the appropriate language and writing system. And sometimes people change their names, too. I did it (twice! ), and so have many other people. All this means that people’s names should be translatable, just like books, articles and software interfaces. Facebook and Google+ allow me to add a very limited number of names in foreign languages. Why wouldn’t they let me write my name in four, five, ten languages? This would make it easier for people who speak these languages to find me and to communicate with me. I would go even further and allow people who speak languages that I don’t know well to write my name as their hear it in their language and to add it to my details. Yet again, this would make me easier to find to even more people. Some degree of automation can be possible. A lot of names are, after all, repetitive, so social networks would be able to suggest people with common names how their name would be written in other languages. Wikipedia is actually quite good in this regard: Usually people have the same username across projects, and this username is not necessarily written in Latin letters, but people can customize the appearance of their signature in each project. I did it in a few languages, and people who speak those languages appreciate it. I can only hope that social networks and email systems will allow as much flexibility as possible with this. Looking at this Facebook ad makes me think: Was the Orange Revolution in Ukraine a failure or a success? The Orange Revolution is presented in the Western Media mostly as an uprising against election fraud and for democracy and freedom. But to Eastern Europeans it was mostly about Ukraine’s relationship with Russia: Will Ukraine develop its own independent identity or will it remain little but Russia’s twin? The questions of nationality, language and identity were far more important than the questions of democracy vs. authoritarianism. Yuschenko won the Orange Revolution, but lost the last election. Ukrainians, even those who supported his nationalist ideas, were disappointed: he seemed to do little but talk about how important it is to speak and write Ukrainian instead of Russian, proclaimed controversial figures such as Roman Shukhevych national heroes and promoted the Holodomor narrative, also rather controversial. The Ukrainian language is going rather strong – it is the preferred language for many young people, it has an excellent music scene and it’s flourishing online. But it is not yet the language of an overwhelming majority – millions of people in Ukraine speak Russian for various reasons. As this advertisement testifies, Russian, the “occupier’s language”, is strong enough in Kiev to be used for marketing the city. So, the nationalistic element of the Orange Revolution may have been somewhat of a failure, which can’t be too bad, but its democratic element is probably doing well. The government can, and probably should, force Ukrainian in documents and education, but it cannot stifle other languages in commerce. Yuschenko may hate it, but that’s the beauty of democracy.